Finally Airtel Nigeria has released their unlimited data plans but the prices are questionable. Recall last week, the network provider gave customers a video teaser about the upcoming mouthwatering plans but how good is it? Did it meet our expectations? Is it a friendly package for everyone? All these will be answered once you are done reading this post. Well, Airtel unlimited data plans are targeted at heavy internet users who always download, stream and access the internet on frequent basis. These Airtel data bundles works on Android devices, iPhone, Symbian, Java, PC, Dongles and Modem so it's an all round package for airtel subscribers. However, the concern of many people about this plan is the price tag. Am sure these plans aren't targeted at students or unemployed as most of them may not afford it. Also Airtel claimed its unlimited but it's just a matter of time before we confirm if it's actually unlimited because we have experienced similar adverts of unlimited data that turned out to be capped at some stages from other networks. Also we are yet to know if the connection speed will be throttled at some stage after subscription. Alternatively you can subscribe by dialing *141# and following the on-screen prompts. From my quest to actually know if this data plans are unlimited, I contacted Airtel Nigeria via their customer care and the person in charge that moment said it's unlimited but speed throttling applies at some stage. According to the plan you choose, you may get 252kb/s throttled. I wasn't convinced, so I had to contact them via their social media handle and they dropped the bombshell. It's data capped! So see the data allocated to each if the so called "airtel unlimited data plans" below. N10,000 package is capped 100GB, N15,000 package is capped 125GB and the N20,000 package is capped 160GB. Note that fair usage policy will be attached to these plans. What do you think about these plans? Honestly, it would have being better if Airtel included at least 3day and 1week plans at a lower price in order to spread their tentacles to those who can't afford the monthly plans. What do you think 💭? Ìf it unlimited data for the 3 plan.why on earth will someone subscribe for 15k and 20k own. It caption and that is not unlimited. Using 10k to buy data?.. Haaa weda unlimited or limited its damn costly Mbok! I am telling you, it's pure madness. Either they are capped or some have speed throttling. Let's wait and see how it goes. Network providers are sometimes known for giving misleading information to the public. Airtel claimed its unlimited, yet the validation period for all are same but with different prices. That alone signal fishy deals. the statement above shows that the data is capped just like MTN happy hour. Also, it has different price tag which shows that it's capped. Two previous commentators above have already said what i was about dropping here. It's not totally unlimited because the activation codes are different coupled with price differences also. There will be another hidden issue of speed throttling based on my personal opinion. 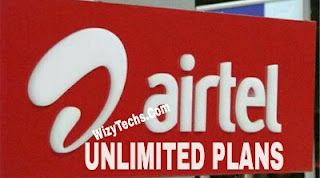 Airtel will soon come out with weekly and daily unlimited data plans. It Seems Their Targets Are The High End Users And They Want To Make Quick Profit. So I'm here once again to share a little info which I'm sure will put our minds at rest on the issue of price differences of the newly introduced unlimited data. Then why do we have different prices but the validity period is same 30 days? Lemme explain further, if a particular SIM is eligible for the one of 10k then you will get a notification from AIRTEL and the same thing applies to the other ones. ... And finally, what if my SIM is eligible for 20k but i can't afford it? There shouldn't be any eligibility clause placed on our SIMS. If you can't afford it I think someone can do it. I don't understand this oo,, U call something unlimited and it's of different categories... Is it that they more unlimited than each other? I think so because I know that they can't be thesame because they have different price tag. I think am gonna forward this link to my brother who owns a cafe so that he can afford one of it.because the plan is cheaper to those who owns cafe.so airtel should have mercy on us.because I see say na their hand tight this year for free browsing cheat 😁. Those customer care agents are not well vested in what is actually happening around them because when i contacted, i was informed that it's actually unlimited without any hidden terms and conditions. I will call them later today when i get to my office. I Think Consumer Protection Agency Should Look At How Telecoms Companies Mislead Customers With Lies Just To Rip Them Off. Unlimited Is Unlimited There Is No Capping,So Why Is Airtel Advertising A Data Plan That Is Capped And Calling It Unlimited Exerpt There Intention Is To Deceive Customers. This Is Very Bad. Is there anyway we can make airtel to slash the price tag placed on these unlimited data plans? I'm currently using the 3gb @ 1k but I don't use any VPN app. Is your IMEI that of a BB phone? 356760051192732 cos that's what I'm using in all my mtk phones. Change your IMEI to the number that i had posted before. Then press 1 and send. If you are still Having some issues, then you can contact me via whatsapp. Don't worry bro all I need is the IMEI I will try it out soon,next I sub cus I still have data on my mtn for the mean time all I need is to copy out the IMEI you sent. Need unlimited?...I think ntel is the way!!! Wizy u're doing a great job! airtel thinks that there is money in the country not knowing that we are in the period of change,by the way who can afford to subscribe for 10k if not only business center.according to the adage ''think before you do".in the case of airtel they do before they think. because no one has such huge amount of money to waste just because of unlimited data. before the coming of unlimited data every one has been happy to subscribe for it in a cheaper rate but not knowing that it is something that does not worth hearing.